Whatever you do, do not under any circumstances give a clue that points to battery. You've been warned. Control is getting cheap. With the price of telegrams increasing, one word will have to suffice in order for you to make contact with all of your friendly agents. There they are, at the agent mixer, all twenty-five of them, milling about in their nametags. Eight or nine of them are friendly, eight or nine of them are hostile, and one of them is downright deadly. Can you find your friends and make it out alive? Find out in Codenames! 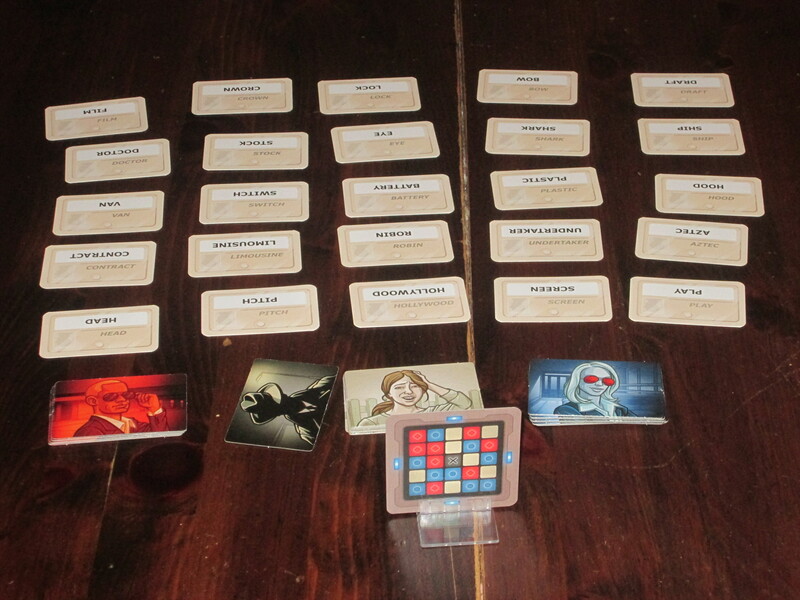 Codenames is a party guessing game for two to twelve (or more) players split into teams. Each team has a spymaster who gives clues to help the team find its agents, and the first team to make contact with all of its agents wins. The players are divided into two teams, and each team chooses one player to be the spymaster. Players lay out a 5×5 grid of word cards representing various agents and set the identity placards in piles by the spymasters. The spymasters look at a key card that corresponds to the 5×5 grid identifying each word as either an agent for one of the teams, an innocent bystander, or the assassin. The key card identifies which team goes first. On a turn, the spymaster must give a clue to the team. The clue consists of a single word and a number. Aside from spelling out the word for clarification, the spymaster may not communicate except through the clue. The clue word relates to the meaning of words on the table, and the number identifies how many words the spymaster thinks fit the clue. Players on the team “make contact” with agents by touching them, and once the team has touched a word, the spymaster covers that word with an identity placard according to the key. If the team made contact with one of their agents, they may keep guessing up to the number the spymaster gave plus one. If the team made contact with any other agent, their turn is over and the opposing spymaster gives a clue. If the team made contact with the assassin, they lose the game immediately. Note: The game works as described for 4+ players. 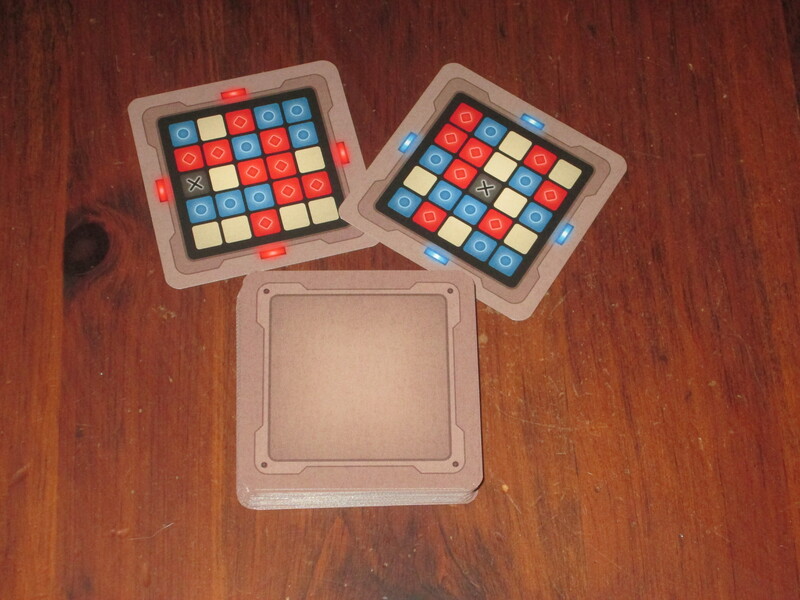 There are variant rules for 2-3 players. James Bond, or Johnny English? Codenames was the hit game of Gen Con. Everyone was playing it. Everyone was talking about it. Everyone was tweeting about it. And it’s essentially a party game, and one that, on the surface, looks kind of familiar. What gives? Codenames falls into that ever-elusive category of games that feel more discovered than designed (which, as I always say, means they are very well designed indeed). There is something familiar about Codenames, yet it is executed in a way that’s wholly new, or at least in a way that feels completely fresh. We’ve seen clue-giving games before (e.g., Catchphrase and Password). We’ve even seen clue-giving games that restrict the words you can use for clues (e.g., Taboo). But Codenames takes familiar ideas and integrates them into a thematic whole that gives them order and makes for an utterly compelling game, one that is equally compelling to casual gamers and gaming veterans. Codenames is compelling because of its restrictions. 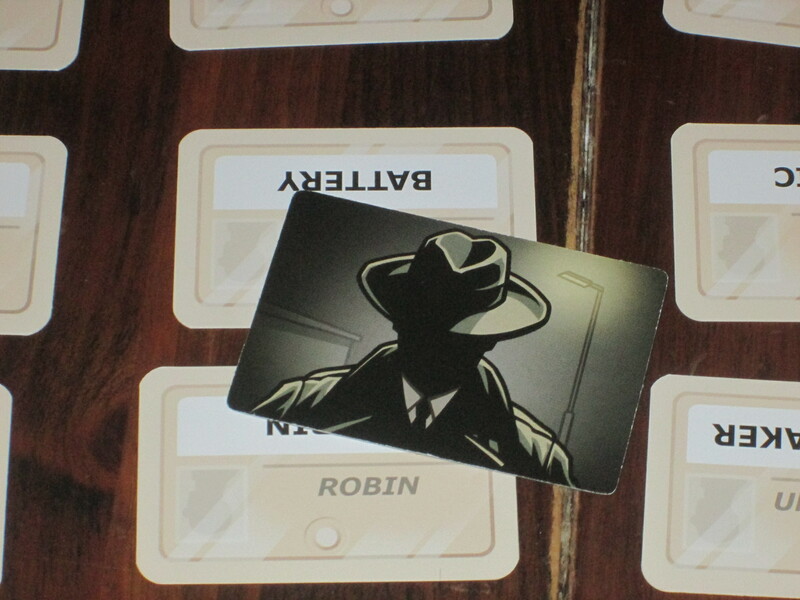 2015 has been the year for party games predicated on silence, and Codenames similarly uses silence to great effect. The spymaster can communicate only a word and a number, and it’s up to the spymaster’s teammates to interpret what this clue means. A word like “cuisine” could refer to cooking implements, people who might prepare food, countries known for their food, and of course things that could be eaten, along with any other meaning the spymaster’s teammates can come up with. There’s usually a cluster of meanings that surround a word–connotations–and it’s up to the spymaster to choose a clue that identifies some agents while eliminating others and up to the teammates to parse those meanings and interpret the clue. While giving single-word clues for single agents is easy, spymasters aren’t likely to win the game that way. The game encourages spymasters to take risks, to find clues that apply to a broader swath of agents in order to maximize the efficiency of their turns. The rulebook says spymasters aren’t allowed to say things like “This is a bit of a stretch” because “You are playing Codenames. It’s always a bit of a stretch.” And herein lies the game. Whatever you do, do not under any circumstances give a clue that points to battery. You’ve been warned. 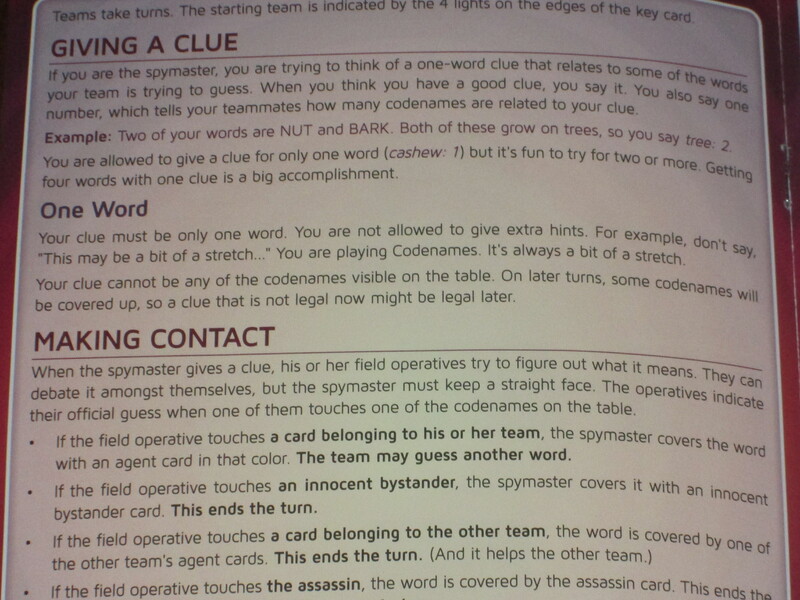 I think what separates Codenames and elevates it above most (if not all) other clue-giving games is the assassin. This concept is utterly brilliant. Choose a neutral card, and it stops your turn. Choose the opponents’ card, and you help them win. Choose the assassin, and you LOSE. Simple as that. So teams are discouraged from cavalier guessing, and spymasters not only have to weigh which clue will direct their team to their agents, but they also must choose clues that don’t come within a mile of the assassin. Which is harder to do than it sounds, since you can only give one-word clues. In one game, my spymaster gave the clue “Physics-2.” We chose the word “force” with ease, but we were stuck on the other one. “Lab”? “Fly”? “Apple”? (Isaac Newton has a long reach.) We chose “lab” first, and then on a later turn, we chose “apple” as the most likely guess. And like Adam and Eve, we were cast out of the Garden, just like that. It’s just those kinds of misunderstandings that make the game worth playing, because just as soon as a clue leaves your lips, you realize that you missed something, and it’s too late to correct your error. The damage has been done. My wife once gave the clue “Easter-3,” and “rabbit” was, to my surprise, not one of the agents she was indicating with her clue. Or you realize there are multiple ways to understand the clue you just gave. The word “quarry” (as in one of our games) can mean a place where stone is harvested, or it could mean something being hunted. Or, mispronounced and misspelled, it could mean “to ask.” (And yes, some at the table entertained this as a possible meaning of the clue.) The only clarification the spymaster is allowed to grant is spelling, which might help in distinguishing a question from a rock pit but not in distinguishing a mine from a mark. Add to this the further difficulty that words connote different things to different people–the clue “fortress” points to “ice” for some and not for others–and you have a healthy recipe for misunderstanding. 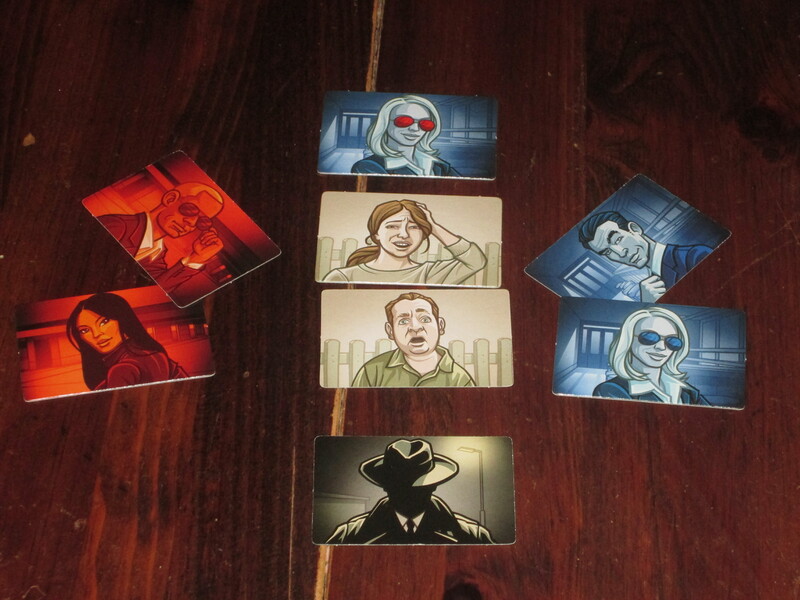 The spymasters use these cards to reveal to the other players the identity of the agent they’ve just contacted. If misunderstanding makes the game worth playing, full comprehension might make the game even more worth playing. Which is to say, Codenames is great whether you’re good or bad at it. It’s completely invigorating to direct your teammates to the correct agents, to be working in such close concert that you might really be reading one another’s minds. While not invigorating, it is nonetheless entertaining to watch a team completely implode when spymaster and team are talking past one another. It’s like watching a professional ballet in the first instance; like watching Elaine’s full-body dry heave set to music in the second. Both are entertaining in their own way. And I’ve been on both sides of Codenames. At work, my clues were great, and I was in sync with my teammates, guessing correctly at longshot clues. At game night…well, let’s just say that I didn’t win a single game, even after switching teams to make my environment more congenial to winning. The game is fun whether you are winning or losing, and it is also fun whether you are playing as a teammate or as a spymaster. The spymaster has the much harder task of choosing judicious clues, but teammates must work well with their spymaster in order to interpret the meaning of what has been said. There’s work to be done on either side, and the game depends on all parties pulling their weight. There are forty of these, and each key card can be rotated four different ways. It’s safe to say that you won’t play the same game twice. I mentioned that it’s difficult to think of clues. The great enemy lurking in the shadows of a game like Codenames is the ever dreaded Analysis Paralysis. Some players will want to stare and stare at the board, waiting for the perfect clue to jump out at them. This could be agonizing but for the inclusion of a small sand timer, which any player may turn over at any time to “encourage” the active player to make a choice quickly. This keeps the game from bogging down in perfectionism. Most of the time, with players of goodwill, the timer won’t be necessary. But it’s nice to have the option when you need it. I think what makes Codenames so great is that it is a tremendously clever game whose cleverness is not evident in the rules. The rulebook is eight short pages filled with diagrams and variants. But the game allows the players to feel clever by discovering connections between disparate words and communicating economically with teammates. Codenames offers near limitless replayability. The game comes with two hundred double-sided word cards, so as long as you are scrupulous in how you put them away, you can have many different setups. But even more than this, you could potentially use the exact same 5×5 grid of cards and play a completely different game based on which key card you use. And more than this, although there are forty different key cards in the box, each key card can be oriented in four different ways, leading to completely different clue relationships and thus completely different words to avoid. Still, the game feels ripe for word-card expansions, and given the early popularity Codenames has enjoyed, I don’t think you have to worry about this game going stale even if you do tire of the four hundred out-of-the-box words. Codenames, as good as it is, does have a few features that some won’t like. For one, the game’s strict requirement of limiting the spymaster to a clue and that’s it must be a hard-and-fast rule. Even in Mysterium, some beyond-the-grave communication is usually allowed: we’re all on the same team, and it’s hard enough anyway, so some light chatter off-topic is okay. In Codenames, it is not. The reasons for this make sense: it’s a competitive game, and really any communication other than the clue gives something away. When the team is discussing something and the spymaster is fiddling with identity cards, anticipating your guess, that’s a dead giveaway for what’s about to happen. Asking, “Is that your guess?” has the potential to sway the team from one guess to another. Explaining an ambiguous clue gives far more information than merited. Even saying something like “I’m so glad you got that one!” or “That’s exactly what I was thinking!” throws the game off balance because part of the challenge is that you may guess an agent that is yours but that still was unrelated to the clue. So the rule for spymaster silence must be strictly guarded in order for the game to work properly. 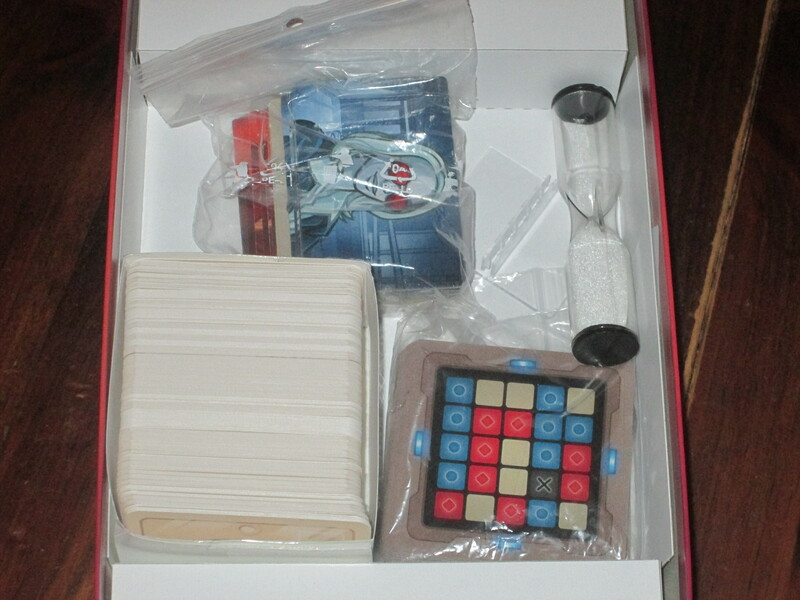 All of the components for Codenames. Despite the sparseness of the components, there is a ton of fun in this box. There is also the potential for a runaway winner. It’s hard to come back from falling behind in Codenames because the leading team can often maintain their lead by simply giving obvious clues that refer to only one word. I don’t see this is as a problem; it’s not like the team in the lead didn’t earn it, and there is always the possibility that the team behind can make a big comeback with a hail Mary clue. But games are not always tense. And, as in any mind-reading party game, there is the potential for team incompatibility. You might not think on the same wavelength as your teammates, and that can be frustrating. This isn’t so much a bug of the game as a feature, and you have to make some allowance for this (as you do for any game of this type). There will be some teams that are much stronger than others, and that’s okay. The components for Codenames are not lavish, but with a $20 MSRP, and given the amount of fun in the box, Codenames is a steal. The identity placards are nice and thicker than the word cardstock, and they’re double-sided, with men on one side and women on the other. There is a co-op mode for two or three players, and this works very well, but I think the game shines in teams. Still, if you get this as a two-player game, you won’t be disappointed. This year has been a great year for social games with the release of Mysterium, Spyfall, and Codenames. Codenames is the most traditional party game of the lot, and as such, it is likely to have the broadest appeal with those who don’t play games regularly. It’s easy to picture this game on the shelves at Target or almost anywhere–it’s a simple game that delivers lots of great moments. What has surprised me, though, is how those who play games as a more serious hobby have taken to Codenames. People who would regularly roll their eyes at Catch Phrase, Taboo, or Password will sit down with Codenames and request to keep playing. Codenames isn’t the best game of the year–it may not even be the best game of Gen Con–but it is probably the most versatile. It’s certainly in contention for the best party game of the year (and this year has provided stiff competition indeed), and it may be the game that sees the most frequent play with my family during the holidays. And I won’t mind if it is. 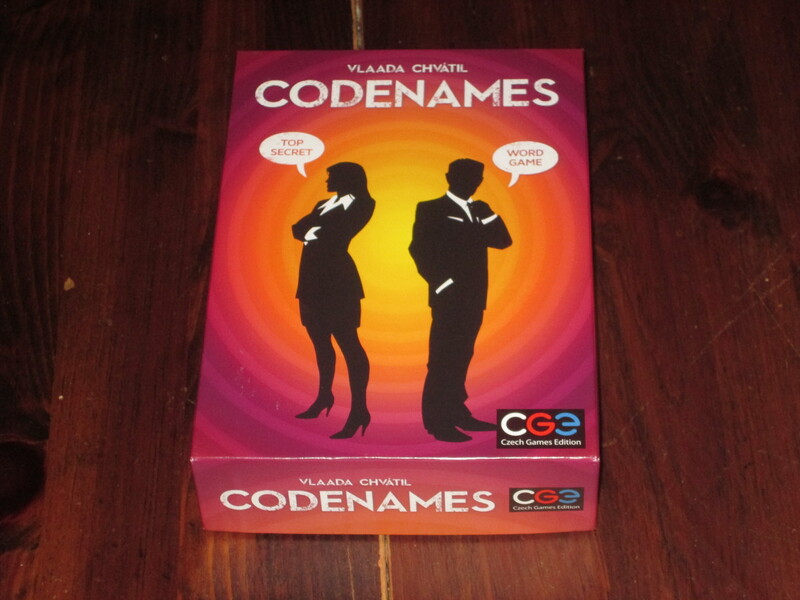 iSlaytheDragon would like to thank Czech Games Edition for providing us with a review copy of Codenames.